The most obvious reason why floral tattoos appeal to people is pretty simple – they’re nice to look at. They can also hold many different meanings, depending on the particular flower that’s chosen. As one person put it, “I think they’re popular because they’re aesthetically pleasing, could have a lot of different meaning, as well as a lot of different ways they can be depicted – floral…is common, flowers grow everywhere, most people like flowers”. This person also said the appeal for her lies in the natural shapes of these kinds of designs, “I’m drawn to organic forms and I can attach my own meaning to them, even though the concept of ‘floral’ is popular, I can still have a unique and personal tattoo within that”. Shannon F. echoes this sentiment, saying that you can’t beat something that is, by its nature, beautiful, “they’re so pretty to look at. Same reason people buy paintings of flowers, or put flowers in vases around their house. Or plant gardens. They’re beautiful. They’re natural. There [are so] many different options, and types, and colours”. There are a lot of reasons why people like floral tattoo patterns, but a big one seems to be their visual appeal. There’s a largely unknown historical element to floral tattoos, as Sara B. explains, “I learned about this thing from the Victorian era called floriography, or ‘language of flowers’ — essentially, the upper classes developed a system of sending coded messages to each other through bouquets of flowers, with every flower type having a specific meaning. I thought it was neat, so I started designing my tattoos based on that”. We’ve already mentioned that different flowers have different meanings, but you can take a page from history books and use those floral designs to send secret messages to others through your tattoos! Aside from the interesting historical background, Sara believes that it’s the link to nature that draws people most to floral designs, “I think people are naturally drawn to…nature. Florals are visually beautiful, and they’re a link to the natural world; it’s a sort of serenity”. Emily B. agrees, noting that flowers are also associated with femininity in many cases, but nature is a big part of the allure, “many people have a favourite kind of flower, they’re so beautiful, so why not put them on your body? A lot of people like to feel attached to nature.” Inking a floral design onto your body is an easy way to feel a permanent connection with flora and fauna. If you want a tattoo design that’s going to age well, then flowers are a safe bet. 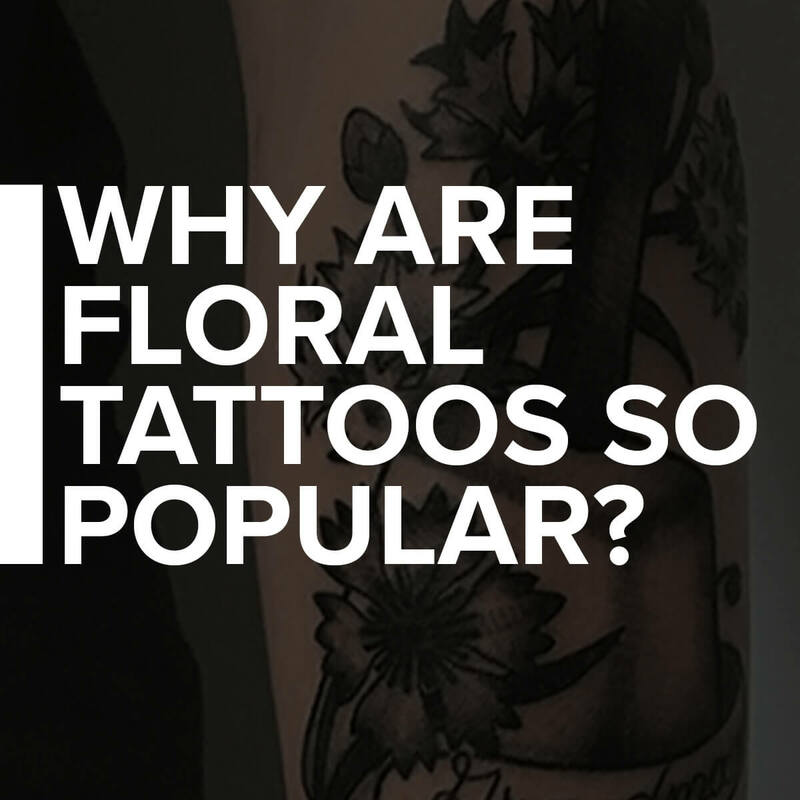 Alyssa C. points out that, in her opinion, “floral tattoos are popular because they are a classic, and will never go out of fashion”. Floral designs aren’t a trend or fad that will go out of style in five to ten years, and they can be a great core piece to essentially any tattoo design, “I’ve incorporated or featured flowers in nearly all my tattoos, because flowers have a subtle language that appeals to me. A flower can represent a person, a country, a feeling, an experience, and more without making the connection obvious”. Floral tattoos also provide an easy out when strangers ask about your ink, “If someone asks me about a piece, I can just say I got it because ‘it’s pretty’, without having to explain the deeper personal connection to a stranger on the streetcar”. Sometimes the appeal of a flower design is as simple as your childhood memories. This was the case for Ariel O., as she explains that flowers are such a relatable image that can easily symbolize our own life experiences, “a lot of people have some kind of memories associated with floral motifs. I have a tattoo of a lilac branch, because my whole life we had lilac growing in our backyard, our front yard, and a branch in the kitchen when they were in bloom. My mom loves them, my grandma loves them, and I’ve grown up loving them too”. Maggie C.’s peony tattoos were inspired by a similar idea. She chose a peony for her tattoo “simply because it’s my mom’s favourite flower, and I grew up with [them] in my childhood home”. Flowers can be the perfect design to symbolize a person, especially if that person is someone who played an important role in your life. Almost everyone we talked to mentioned versatility as being a huge factor in the charm of floral tattoos. Maggie believes that the sheer number of options to choose from plays a big part in their popularity, “there [are] a variety of different flowers, so people can maintain originality and uniqueness in their designs. Also…it won’t be like a pinterest tattoo that you see on every other person”. Flowers are also a soft segue into tattoos, especially if you come from a family that is traditionally against body art. Maggie found that floral tattoos seem to be “more of a socially acceptable tattoo, in a way…for me my flowers were my first tattoos and my parents accepted it a lot easier than my other ones”. She points out that floral designs can be executed in practically any style as well, “[floral] looks wonderful in every style of tattooing, so it works well [no matter] what style the artist or person chooses”. Emily agrees, adding that “there [are] lots of different…ways to do it, from a rock’n’roll kind of rose, to a really dainty, delicate flower”, which allows people to express all kinds of personality traits and meanings through floral tattoos. Sara particularly likes that “florals are…fantastic for tattoos in that they come in all shapes and sizes, so it’s easier to find a design that fits the particular contours and lines of the body in a flattering way — unlike other kinds of designs, you can put a floral tattoo just about anywhere and it will look good”. Kristina Walsh is a tattoo artist out of Unique Ink in Barrie, Ontario. She says that on average, she tattoos at least two floral designs a day, on both men and women. She finds that, for the most part, flower tattoos are done because of their aesthetic appeal “A lot of girls (and some guys) get floral work because it’s a nice way to decorate your body without having any deep meaning. They’re super pretty, and timeless and…accentuate [the] body”. Her most commonly requested floral designs are “mostly black and grey, like thin and dainty lines, with minimal shading. I’ve done a couple [of] colour flower pieces, but not many”. She adds that, in her experience, it’s men, not women, who go for color in their floral tattoos, “guys get more colour, and girls tend to stick with black and grey”. Depending on what the theme of your piece is, the options for color scheme are endless for flower tattoos, but they can pack just as much visual punch as a colorless design. Tattoo designs that incorporate flowers have been popular for decades, but they’re becoming especially popular as people strive to feel a connection to nature. There are many different reasons why people are drawn to these kinds of designs – as Shannon pointed out, paintings and home decor involving flowers have always been incredibly popular. The only difference is that now people are looking to have these works of art on their bodies, instead of on a canvas or in their gardens. What was the allure for you in getting a floral tattoo? Let us know in the comments!